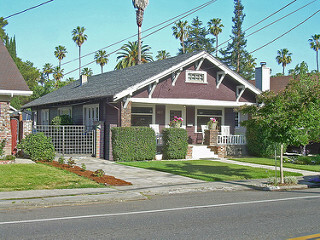 A Craftsman-style home in San Jose. This is the first installment in a series of bimonthly posts about architecture styles, each dedicated to a popular home type that can be found in the Bay Area. The Craftsman home is a piece of work. Literally. And by that we mean that the home builder’s highly skilled work is prominently on display. Simple and natural, the Craftsman home often features porches with round columns or stone supports, low-pitched gable roofs, wide eaves with brackets or exposed rafters, and handcrafted stone or woodworking. The Craftsman home’s emphasis is indeed all in the craft — the pared-down, simplistic quality of the workmanship. In its original era, it was also a response to the ornamentation of the Victorian home. Craftsman-style homes were built from approximately 1905 until the Great Depression. They were constructed all over the country and can be found scattered in most older Bay Area neighborhoods. Many homebuyers look specifically for the Craftsman-style home and make a project of restoring it to its original glory. The bungalow is a popular version of the Craftsman, and though the name might suggest a small home, this isn’t always the case. There are definitely Craftsman bungalow-specific enthusiasts, and this website is an excellent resource for them and those who want to learn more. In the mid-1880s, the Arts and Crafts Movement made its way from Britain to Europe and the U.S. This decorative and artistic style presented a more natural, less ornate style of décor and architecture. This movement was the inspiration behind the Craftsman-style home. The Prairie-style home was popularized by Frank Lloyd Wright and the Chicago school of architects. Built from 1905 to 1920, it was said to be the first American architecture style. Prairie-style homes feature an open floor plan, strong horizontal lines, a central chimney, and built-in cabinetry. “The Prairie style had many similarities with Craftsman-style bungalows — including a low, horizontal form and roof lines with wide, overhanging eaves,” according to a post at Historic Home Blog. What does Sears have to do with the Craftsman home? The department store actually sold them through its catalog from 1908 to 1940. Sears had a selection of more than 400 different designs, ranging from small bungalows costing $450 to large two-story homes priced at $4,500. It sold approximately 700,000 kits that were shipped to buyers via boxcar and came with instruction books and 10,000 to 30,000 pieces. There are several ways to tell if you do indeed have a Sears-catalog home — check them out here. The Internet is teeming with photos of, and resources for, the Craftsman-style home. You can check out 10 Bungalow Restorations from Old House Online. Houzz offers a gallery of Craftsman homes to further acquaint you with its unique features. HGTV will take you on a few tours that will give you decorating ideas. Better Homes and Gardens will give your some layout, design, and color inspiration. If you do end up choosing a Craftsman-style home for your residence, congratulations on a great investment. You now own a work of art in a sturdy, square package. Enjoy!